If the stock market is trending nicely up or down, it is easy to stick with the trend. But what do you do when the market goes up one day and then goes down another day? In this article I will show you a simple way to navigate the toughest environment in the stock market. This formula is time tested and should give you lots of advantage over other market players. In order for you to navigate the stock market properly, you need to know how to differentiate when the stock market is in a trending environment and a volatile environment. Most people will be better off riding trends. Meaning, they long and hold stocks when the general market is in an uptrend. When the general markets is in a downtrend, they should short stocks and hold them till the downtrend ends. In a volatile environment, its best to be left to the day traders and professionals because the market can be very whippy during this period. In order to help you navigate a volatile environment, you need to have a system that tells you when to focus on short and when to focus on longs. I have found that using the 50 MA as a filter has been very very effective. Well I believe that it will keep you on the right side of the market 70% of the time. 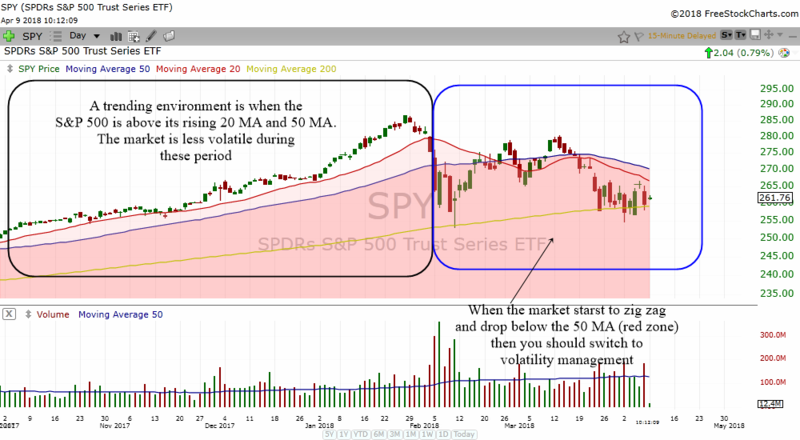 What we need to do is to use the 5 min chart of the SPY, DIA or QQQ. I have colored the 5 min chart of SPY above with red color. The area below the 5 min 50 MA is colored red. This tells us not to buy stocks. Just like a red light traffic, it tells us its a no go area. You only long stocks when the SPY is in the white zone. 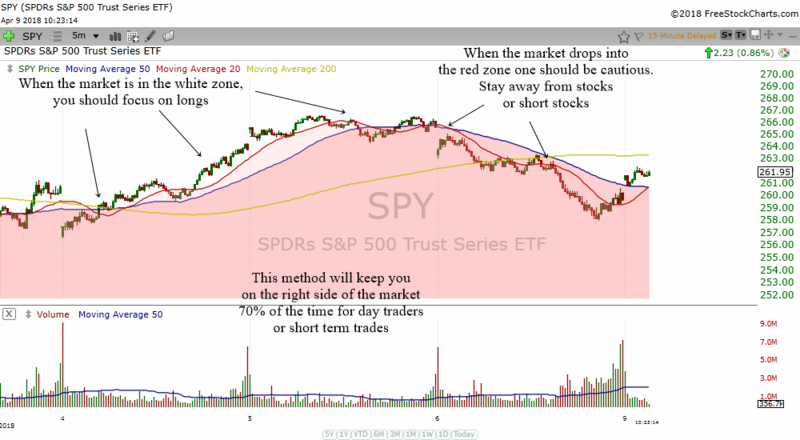 If its in the red zone, you avoid buying stocks or you short stocks. In a volatile environment, the stock market can be up one day and down the next day. Sometimes it allow stocks to go up 2 days before dropping. Therefore, the best way to make money in a volatile environment is to do day trades. This means you will need to close out the position by the end of the day. Even if you decide to hold stocks overnight, you should consider selling it by the second day. That way you will be able to escape the volatile swings that are bound to happen. By the way, in the midst of volatility there is calmness. Notice how the market trends up or down intraday. It just means that you should learn to ride the intraday trend.